Following an autopsy on the late officer of the Nigeria Security and Civil Defence Corps, NSCDC, Ochigbo Ogah allegedly killed by the Police, the result has revealed that his death was as a result of force and continuous torture. This is contrary to claims by the Police that late Ochigbo Ogah Jumbo slumped and died while in their custody. 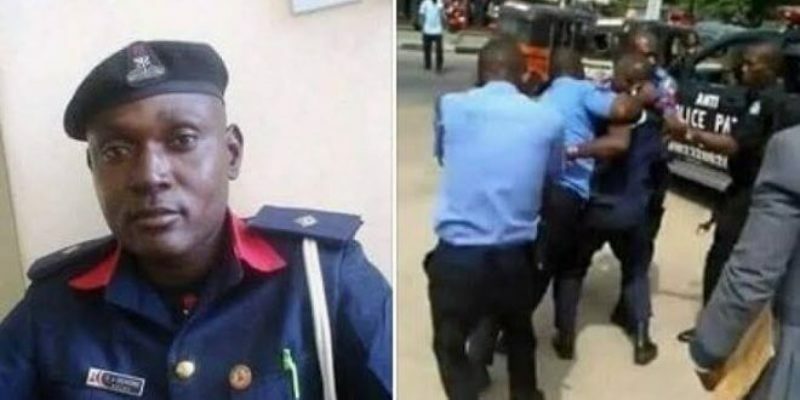 The late Jumbo, an Assistant Superintendent of NSCDC was March 20 reportedly killed by some police officers in the presence of his wife and kids in Nyanya, Abuja. The Police, through the Force Public Relations Officer, ACP Frank Mba, swiftly dispelled the allegation, saying the late Jumbo slumped after driving himself to Nyanya Police station. After unrelenting clamour by concerned members of the public and Jumbo’s family, Mohammed Adamu, Inspector General of Police, ordered a comprehensive and speedy investigation into the circumstances of the death. The result of an autopsy conducted at the Maitama General Hospital on 26th March 2019, revealed that late Jumbo died after suffering from “blunt force injury to the head and cerebral oedema” during the police brutality. Sahara Reporters report that a copy of the autopsy report and the coroner’s ordinances also confirmed that “there was no natural disease in the body to sufficiently explain this sudden death”, as being peddled by the Police authority. “Ada Jumbo, wife of the deceased, in an extract obtained from her statement, said her husband was dragged on the floor for several metres after he was mercilessly hit on the head with a batton. “A family source also told our reporter that the Police authority had never visited nor shown sympathy to the family almost a month when “their breadwinner was gruesomely murdered”, it said.